A deal to take the 31-year-old striker on loan for the rest of the season has been struck with Juventus. According to The Guardian, the Serie A leaders are today set to confirm an agreement is in place with Chelsea . Higuain is then expected to travel to London to discuss personal terms and undergo a medical. Morata, who has flopped since joining for an initial £58m in the summer of 2017, is set to join Atletico Madrid on loan. While talks are being held with Monaco over a permanent switch for Batshuayi. Chelsea will cancel the Belgian's loan deal at Valencia in a bid to secure as much as £40m from Thierry Henry's club, The Guardian claim. Higuain's arrival highlights the extent of Maurizio Sarri's unhappiness with his striking options. Sarri has used Eden Hazard as a false nine due to his dissatisfaction with Morata and Olivier Giroud. 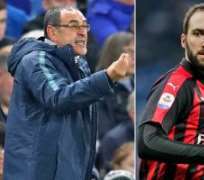 Chelsea chiefs are reluctant to sign players over the age of 30 but have granted Sarri's request for Higuain. The striker broke Serie A's scoring record for a single season with 36 goals while playing for Sarri's Napoli in the 2015/16 campaign. The Serie A club shelled out €18m to sign him for the season, with a €36m permanent option. He has failed to fire, however, finding the back of the net just eight times in all competitions. Milan happy to cancel their contract with Higuain because they are in talks with Genoa to sign Polish goal machine Krzysztof Piątek. Juventus were eager for Chelsea to take on the previous financial obligations agreed with Milan. The two sides played out the Italian Supercoppa in Jeddah last night, and Juventus sporting director Pavel Nedved hinted an announcement was imminent. Higuain came on as a substitute for Milan in the 1-0 defeat and flew back to Italy with his team-mates in the early hours of the morning. He was asked about a move to Chelsea at the airport, but said: “Were you all waiting for me? If you want to create mess [regarding the Chelsea transfer], I'm not the right person for you in this sense.